A year ago the Berkshire Opera Festival brought its first production, Madama Butterfly to the Colonial Theatre in Pittsfield, restoring fully-staged opera to the region after a hiatus of almost a decade. It was a very promising beginning to what we can only hope will become a tradition lasting many more decades. This year they have a brilliant second effort, Ariadne auf Naxos by Richard Strauss, very well sung, staged, costumed and lit. After a delightful opening night this past Saturday, there are two more chances to hear this mashup of serious and very unserious approaches to music. The Colonial Theatre is itself a gem, built in 1903 as a venue for vaudeville and renovated in 2006, an ideal place to experience live music up close and personal. Wherever one sits the stage is a short distance away, and there is absolutely no need for amplification for the splendid voices in this production. They are thrilling to hear. The rather rococo decorations are a feast for the eye for the time before one’s attention is riveted to the stage. Ariadne is the story of what happens when two very different theatrical companies, hired to present sequential entertainments at a dinner party put on by the “wealthiest man in Vienna” are forced to perform simultaneously in order to allow for a fireworks display scheduled for 9:00 PM. One company is a serious operatic one with a young composer, whose new work bears the same title as this opera. The other is a commedia del arte company, skilled in improvisation and other forms of low comedy, singing, dancing and taking pratfalls. The Composer, understandably, objects to this profanation of his “sacred art” though eventually he succumbs to flirtations from Zerbinetta, the leader of the commedia troupe and agrees to make alterations which will incorporate commedia into his opera. Mezzo-soprano Adriana Zabala as the Composer was the standout in the Prologue, which tells this part of the story. Alternately indignant about the desecration of his masterpiece and excited about the idea of creating something new, Zabala commands the stage with feverish intensity. Strauss loved writing for women’s voices, and Ariadne is a prime example. Each of the other two principal women get major arias, and both were delivered with aplomb. The title character, who has been abandoned on a desert island by Theseus and inconsolably devastated by the abandonment, longs only for death to relieve her suffering. She pours this emotion into “Es gibt ein Reich” describing the land where all is pure, i.e. the land of death. Marcy Stonikas brings her large, expressive voice to this suffering. And Nicole Haslett was a charming Zerbinetta proclaiming her right to be fickle and not remain faithful to just one man in the tour de force “Grossmächtige Prinzessin.” Jenny Houser, Rebecca Ringle and Christine Lyons blended their voices beautifully as the three nymphs who attempt to console Ariadne. The male members of Zerbinetta’s troupe were also quite effective in their attempts to cheer Ariadne. The effective staging was directed by company co-founder Jonathan Loy. The prologue takes place on a stage that is half-empty with the wings, lighting equipment and machinery for flying scenery exposed, giving us the feel of being backstage where this action takes place. The other half of the stage is filled with the orchestra (Strauss wrote for a 37-member ensemble). This gave voices and instruments an effective balance. When the action moves to the blended opera performance scenery for the desert island flies in. With a small cast, there is still plenty of acting area. And co-founder Brian Garman commanded a fine orchestra of musicians from the region. 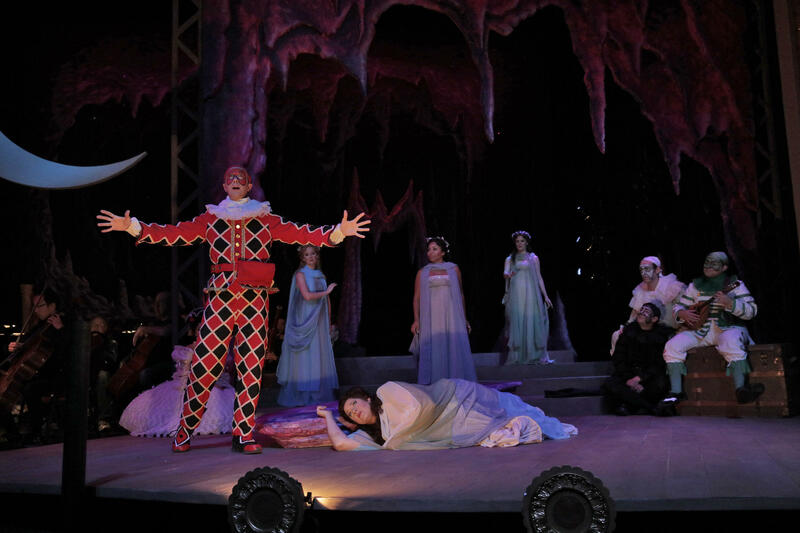 There are two more performances of Ariadne auf Naxos at the Colonial Theatre, on Tuesday, August 29 and Friday, September 1. For New England Public Radio listeners who have been missing our regular Saturday afternoon opera broadcasts during the summer while we have had concerts from Tanglewood, you have a treat in store this Saturday, September 2 as we broadcast a concert recorded on August 26 in which Andris Nelsons conducted the Boston Symphony Orchestra with Christine Opolais, Bryn Terfel, Russell Thomas and the Tanglewood Festival Chorus in opera excerpts including Act II from Tosca and selections from Die Meistersinger, Rusalka and Porgy and Bess. And on Saturday, September 9 we return to regular opera broadcasts every Saturday at 1:00 PM, starting with the San Francisco Opera production of Aida. The Metropolitan Opera’s live broadcasts begin December 2 with a performance of Verdi’s Requiem. My wife and I have been going to the Met pretty much annually since the NEPR travel program began a couple of decades ago with a series of weekends at the Met. 2016 has stood out for history making adventures for us. In the fall of 2015 we bought tickets for a trip at spring break of this year. As it happened we had excellent seats for James Levine’s final performance as Music Director. he conducted Mozart’s Abduction from the Seraglio and we were part of the tremendous ovation which followed, at least 20 minutes’ worth. I wrote about it at the time. On our way home from Boston Sunday we listened to American Routes on New England Public Radio. Host Nick Spitzer asked Blues musician Jimmy Duck Holmes why so many of his songs were along the lines of "the devil must have been in you to make you leave me." Holmes said that despite such lyrics no one is really led astray by diabolic forces; they were following their own desires.